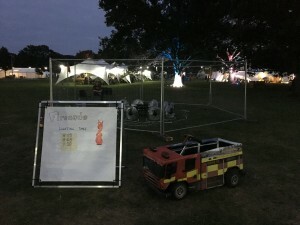 This weekend, Jelly and Marshmallows got to play with fire at Electromagnetic Field 2018. 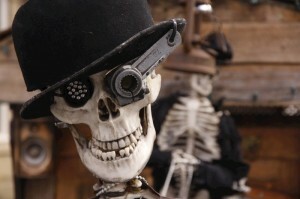 For those who don’t know, EMF is a fabulous festival of geekery, where there are all sorts of making, hacking and technology, with talks on topics from tweetable wedding dresses through how to dispose of dead bodies, to animatronics for movies. 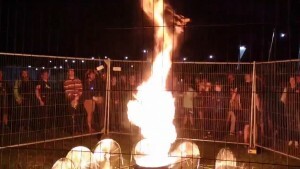 Last time we were at EMF we heard rumours that they wanted more fiery installations so we started thinking and researching. And what we decided on was to run a firenado. 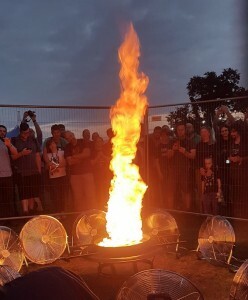 We use ten 18-inch 80W fans to swirl air in towards a fire pit with a 50cm paella dish full of burning fuel (isopropyl alcohol and barbecue lighting fluid). As the air is drawn in the vortex accelerates, just like bath water down the plug hole. The extra air makes the fire burn hot and the flames get bigger, growing the vortex into a column of fire. 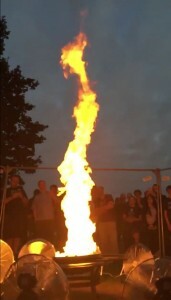 This column of hot rising burning gas actually acts as a chimney drawing the air in at the bottom even faster. The crowd seemed to enjoy the fire and we certainly did! 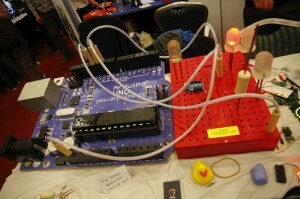 Fortunately the only fire engine that needed to attend was Mark’s Hack Racer Rule Zero! Thanks EMF for sponsoring us (and trusting us) to do it. Also I want to give a quick mention as we took a lot of inspiration from the Firenado YouTube videos from NightHawkInLight and Unallocated Space; thanks guys! This entry was posted in Uncategorized on 03/09/2018 by admin. This model was printed on an UP! 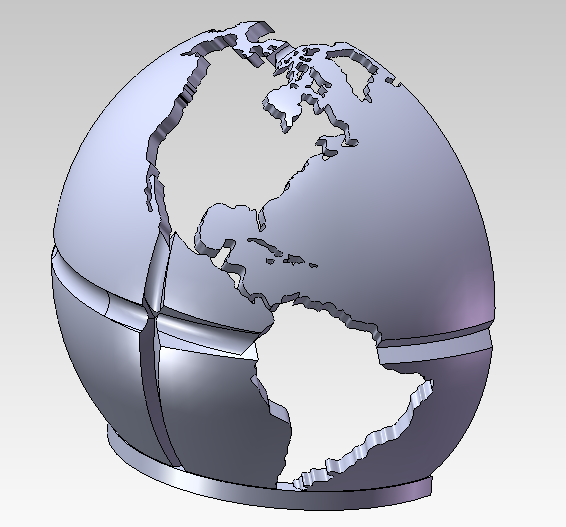 Plus V2 from AngelLM’s thingiverse model. That saved me a bit of effort, thanks! 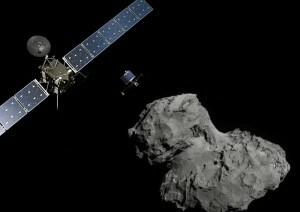 On a serious note congratulations ESA on successfully landing Philae (3 times) on a comet hurtling through the solar system at 135,000km/h 1/3 of a billion miles away. 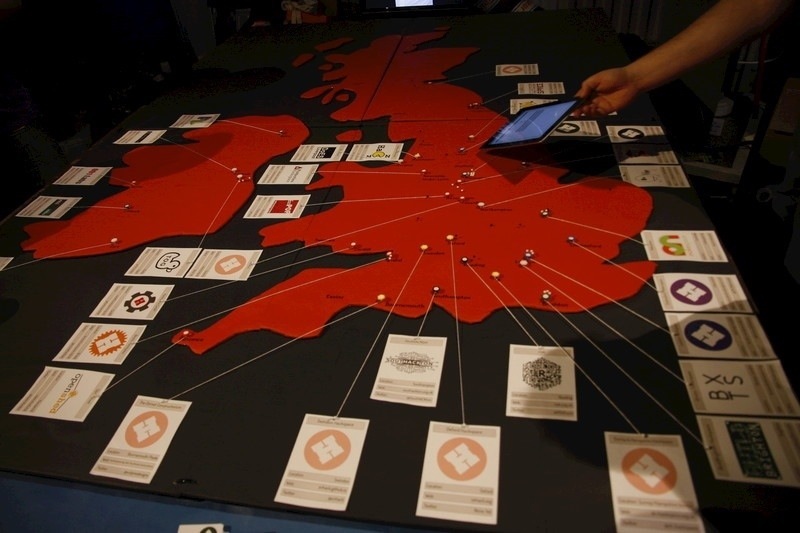 The Kinect tracking was slightly erratic – it randomly lost track of the individual. 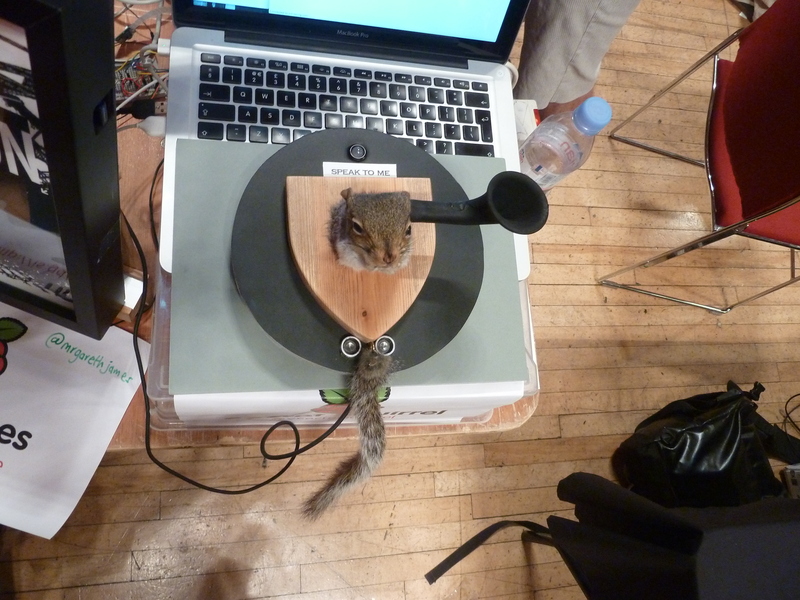 Having been tuned on our 6ish foot selves this seemed to be considerably worse for ‘small people’. The control method was novel and physically challenging. It might sound simple to ‘stick your right arm out and act like a crane’ but your arm quickly becomes tired and required a fair amount of coordination to make the correct movements. Kids have a very wide range of abilities (learning, coordination, concentration) and many of them struggled to pick it up before they got frustrated. 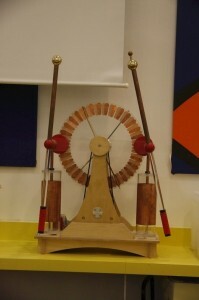 The neutral position for the control was a natural position for an adult, but seemed to require shorter people to lean forward. This made it all the more awkward. 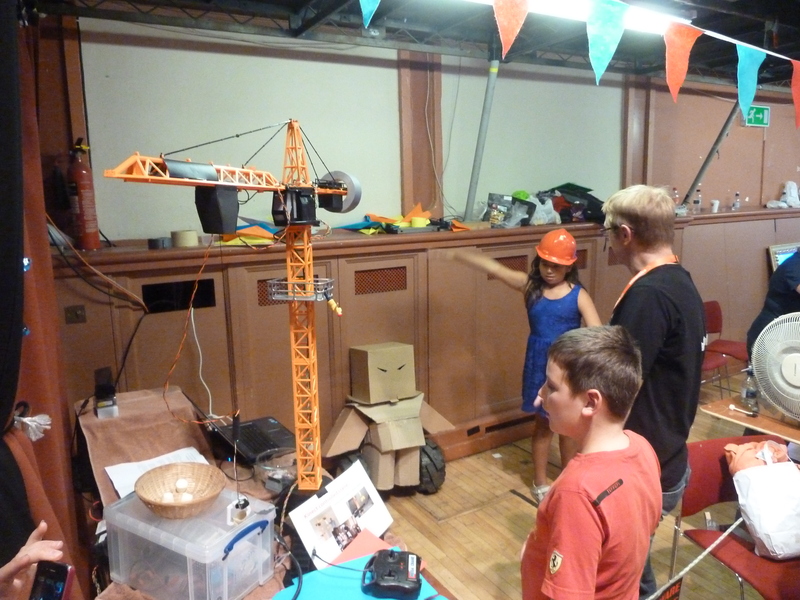 A few older children managed to successfully control the crane to pick up the sweets (one even picked up a bowl full! 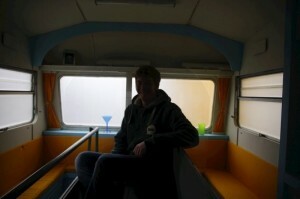 ), but for most it was too difficult. 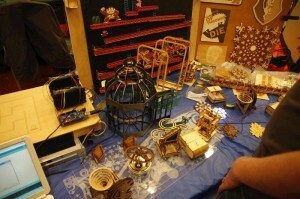 To make it more fun and to allow more people to be involved, we changed the game slightly – the movement of the crane was controlled by the crane’s original wired controller, and the grabber was controlled via the Kinect. 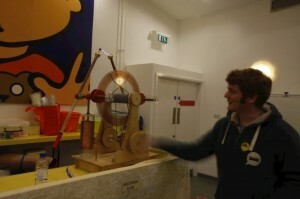 This worked really well, and the kids really enjoyed using it. I think they would have enjoyed using the stock crane just as much though and they weren’t really learning anything. 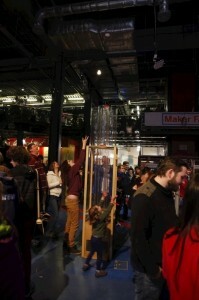 The new wind tunnel performed great, with rarely a break in the crowds of kids and parents vying to get their planes tested. The combination of a simple practical task, a bit of science, some flashy lights, smoke and a big green button seemed to work really well and get people interested. We had a few technical problems with the smoke and the fan control (big green button) but it ran pretty much continuously all day. 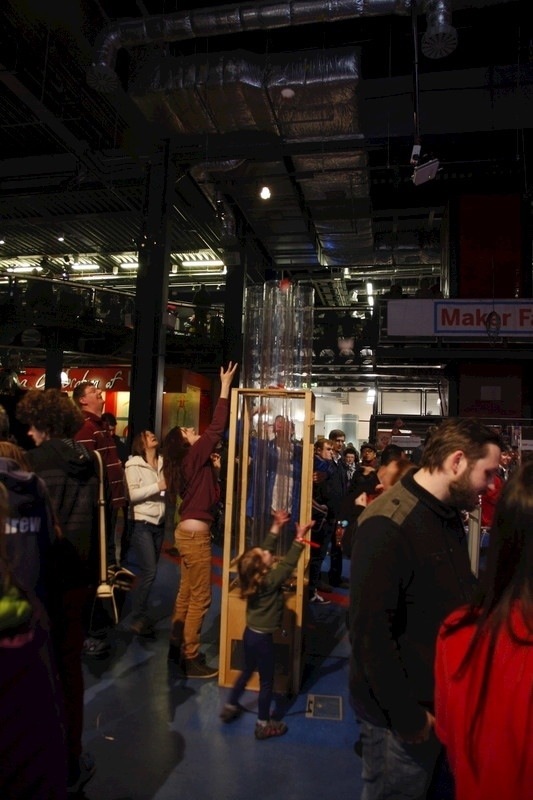 More interesting for us was the response of the crowds to the ‘task’: most followed the simple supplied instructions to make a ‘standard’ plane and were interested in the science of flight. A few made planes of their own design, but on the whole any adults who were interested hung back and just observed. It surprised us that a few adults couldn’t make a paper plane even with the ‘child friendly’ instructions provided! 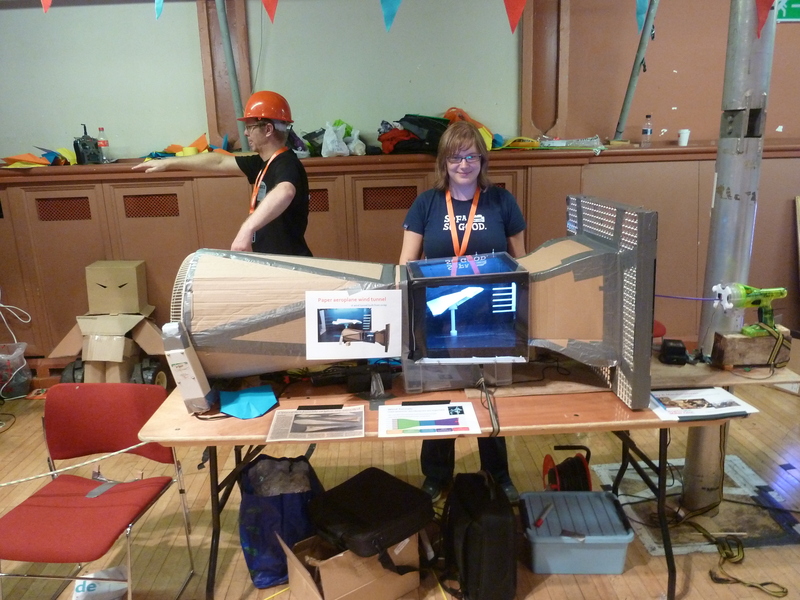 Between the crane and the wind tunnel, I think we learnt a lot at this Maker Faire of what people are interested in and capable of. 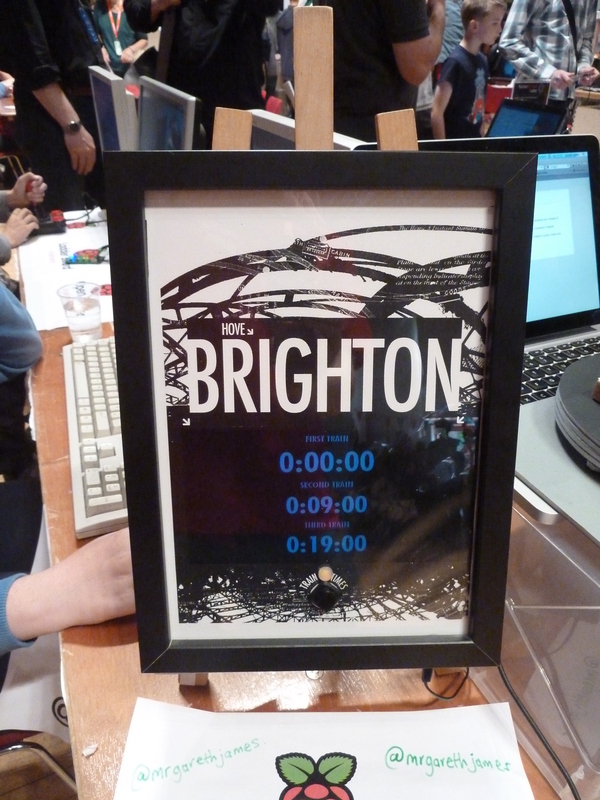 Another stylish project by Gareth was this lovely live display of the next three trains to Brighton from Hove. 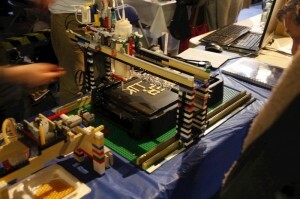 Fabrivan were showing off their big laser, cutting stuff live for the public throughout the day. 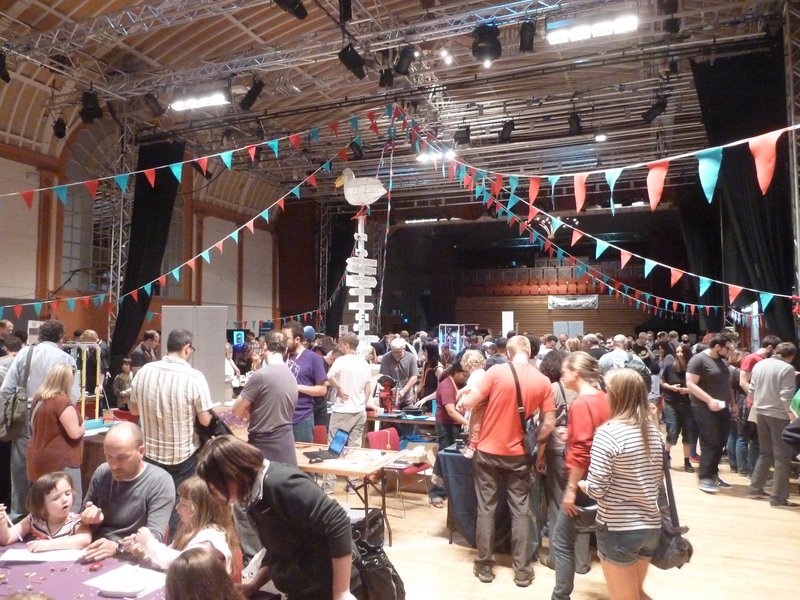 They’re a Fablab/Techshop like outfit with laser cutters, routers etc, based in Brighton. 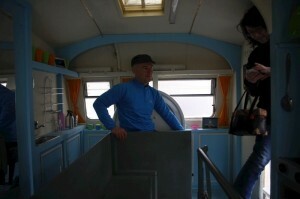 I thought it was brilliant that people could see and access such technology for themselves. This 3d printed pendulum by Robert Hart was a brilliantly simple demonstration of how early clocks kept going and pendulums can keep time. He has an equally brilliant and simple website describing it here. This entry was posted in Uncategorized on 21/09/2013 by admin. A quick post on a little project I’ve just finished. 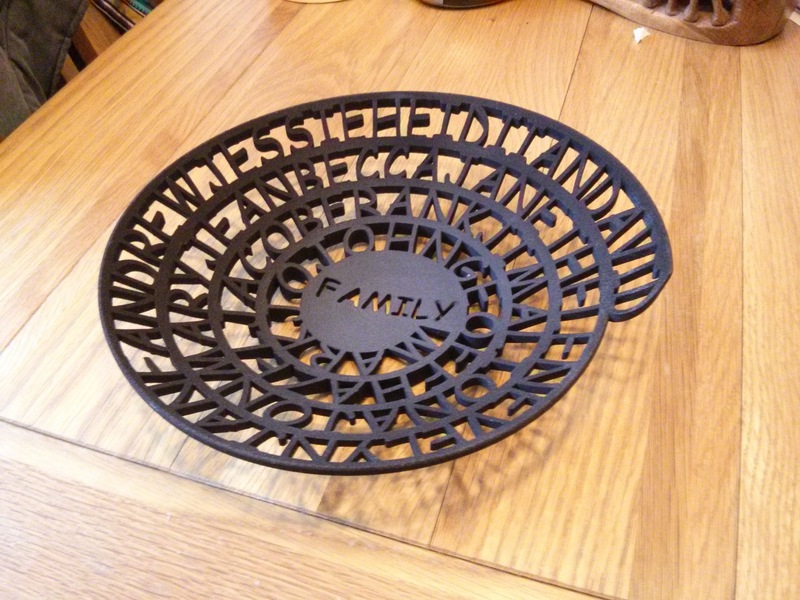 Inspired by the 3D printed ‘LightPoems’ on Shapeways, I’ve created a 3D printed bowl for a present for my uncle. Rather than spelling out a poem, this bowl contains the names of family members. 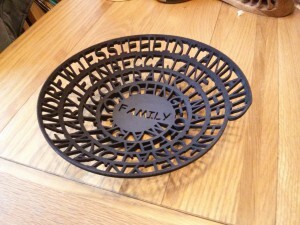 It was printed by “Shapeways” in their “strong black and flexible“. It turns out the ‘black’ part of that materials name comes from the dye used, rather than it being inherent in the material. 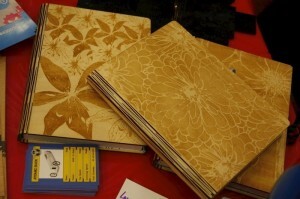 My only criticism of the print is that some small areas are slightly grey or still white. 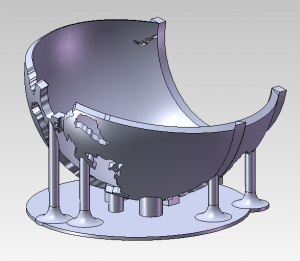 the build layers are also visible in some places, but I don’t think it spoils the bowl’s appearance. 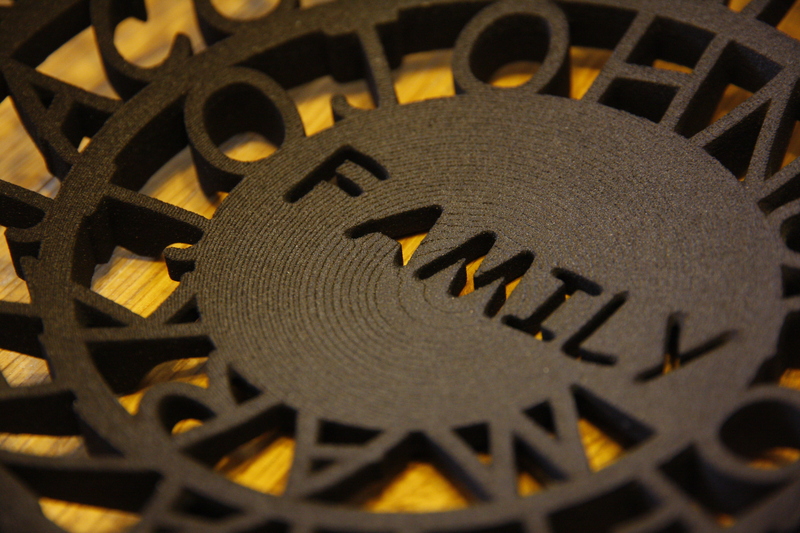 As a reference point, this print is close to the Shapeways maximum print size for black prints of 230x180x320mm?. 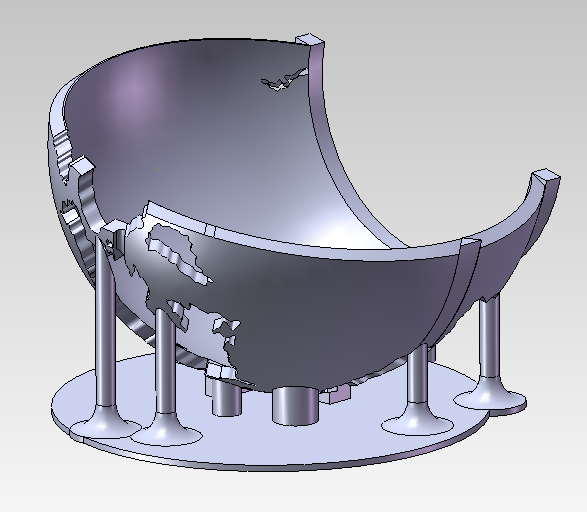 It cost €154, which is a little expensive for a bowl but very cheap for a 3D printed part this large and hopefully will be an interesting bespoke present. 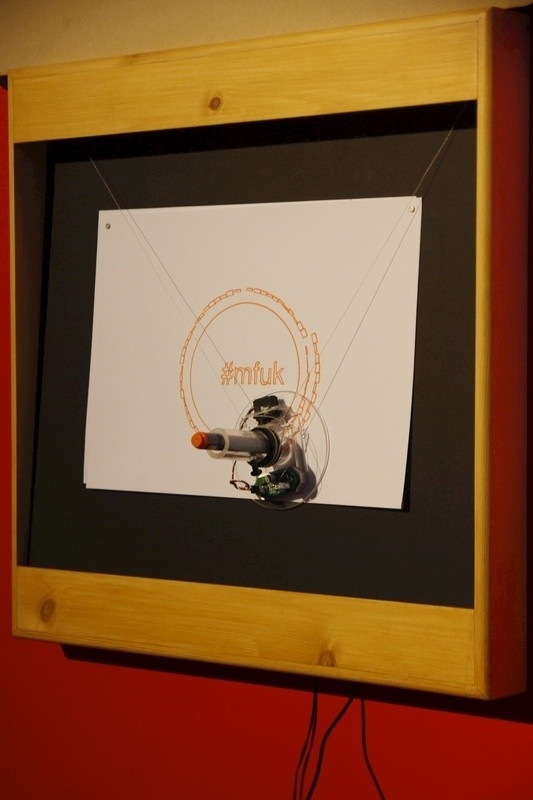 This entry was posted in Uncategorized and tagged 3dprinting, mark on 13/06/2013 by admin. The Polyfoss Factory were demonstrating a very interesting process: they feed recycled and virgin plastic pellets into a candy floss machine to make a new fibrous material. The new material could then be used in low temperature, low pressure tooling (such as in a modified sandwich press) to form new products. 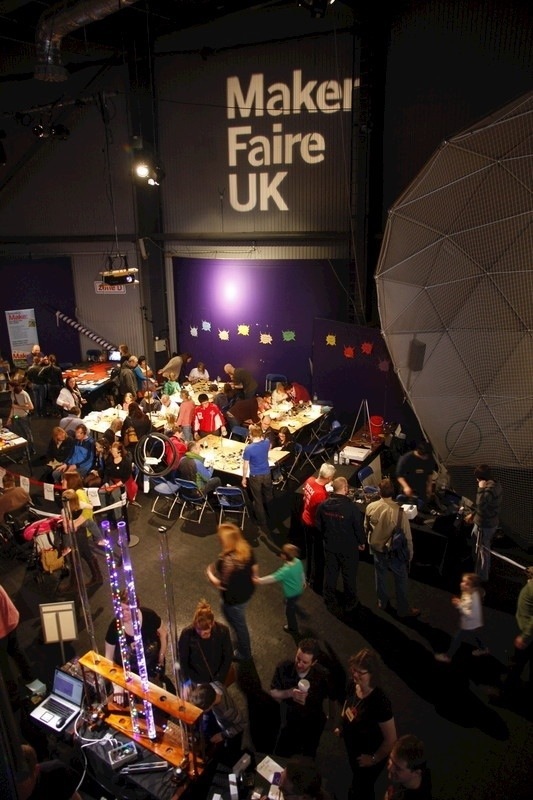 UK hackerspaces were represented by the Hackspace Foundation. 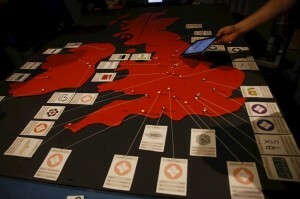 They were building up a map of hackerspace like groups, their members and the people who wanted to be part of a group. Embarrassingly Hitchin wasn’t part of their database so wasn’t on the map, but we soon sorted that out. 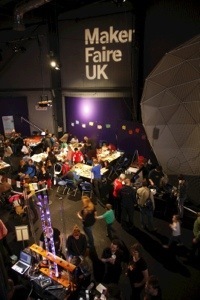 In the centre of the main hall was a ‘make your own jellyfish’ bench. The jellyfish were simply muffin papers? with ribbon attached, but the exciting part for the kids was loading the creation into a ‘windtunnel’ and seeing them float away. We were inspired by the interaction of craft and simple aerodynamics. 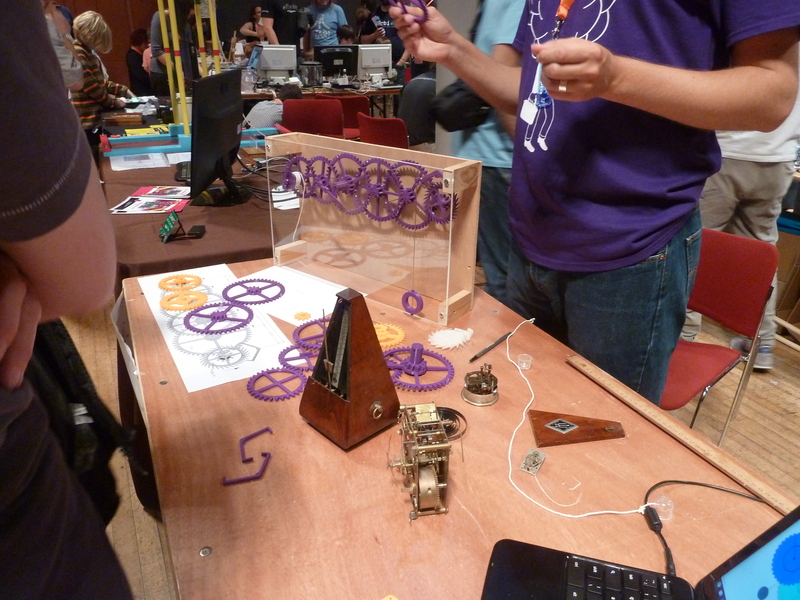 I can see a craft/wind based project appearing on a Jelly and Marshmallows Maker Faire stand in future…. 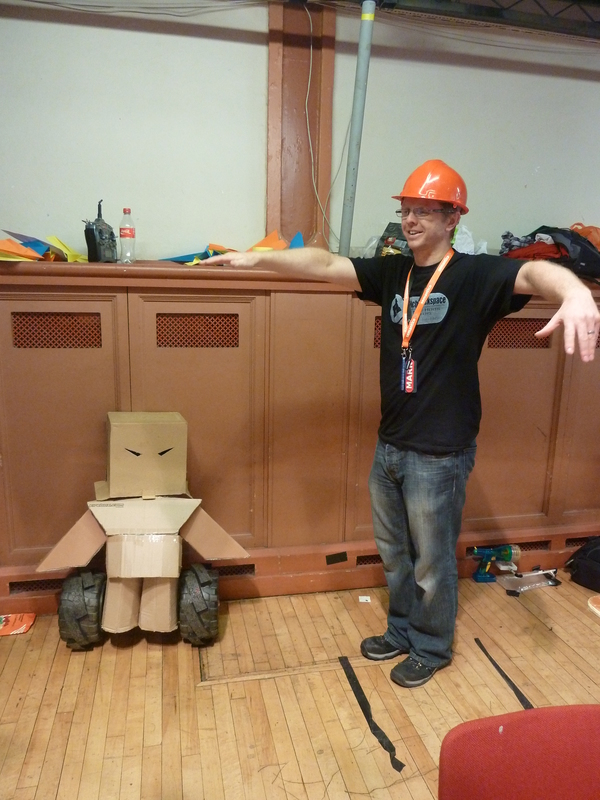 Makerfaires tend to attract some eccentric ‘costumes’. We saw more than our fair share of mad scientists in white coats and steam punk goggles, but one of the highlights for us was this scrolling LEDs sombrero. Matt Venn of the Jam Jar collective was showing off an open source, laser cut drawbot. 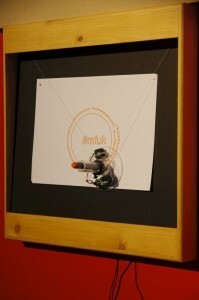 We loved the quirky drawing style mixing jittery lines with perfect perspective. 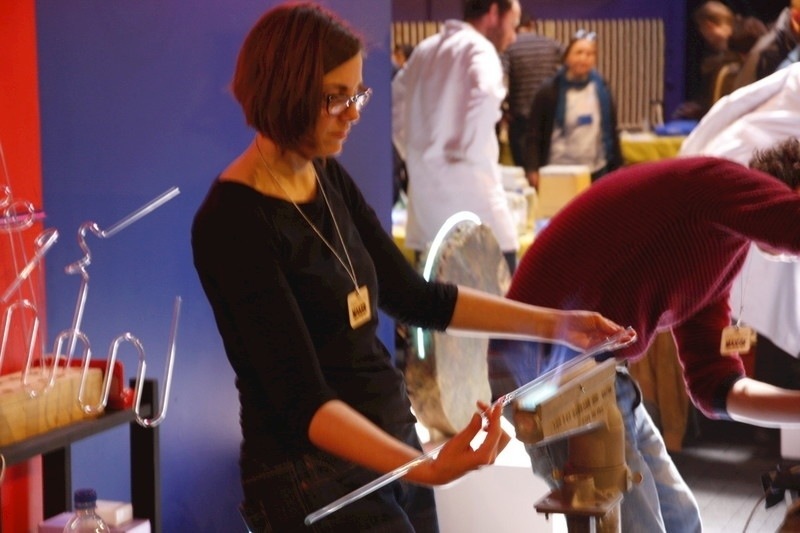 Sarah Blood was demonstrating her amazing glass bending skills, forming neon tubes over a gas flame. The few lucky people who got to have a go confirmed how difficult it is to get a good looking shape. These cool notebooks were laser etched from plywood by Patrick Fenner. 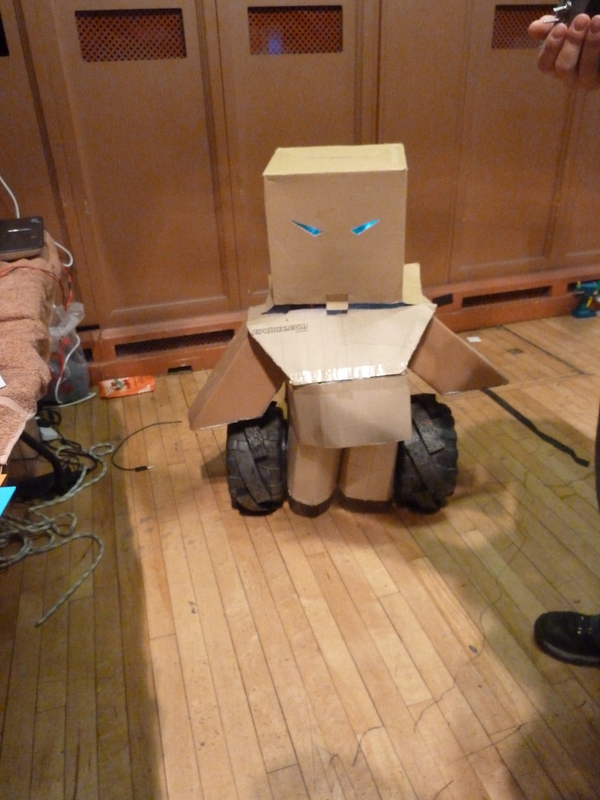 We were impressed by his human powered trike at the last Newcastle Maker Faire, and this year he was showing off the nifty laser cut clip together cases he’s designed. We were impressed by the engineering he’s put into those little clips. Many people would have just drawn a clip that ‘looks right’ then made, tested and developed it through trial and error. Patrick’s analysed the forces and stresses associated with clips and through some basic tweaks to the design created not only a simple clip that’s more robust and easier to use but also a set of equations and guidelines for others to follow. 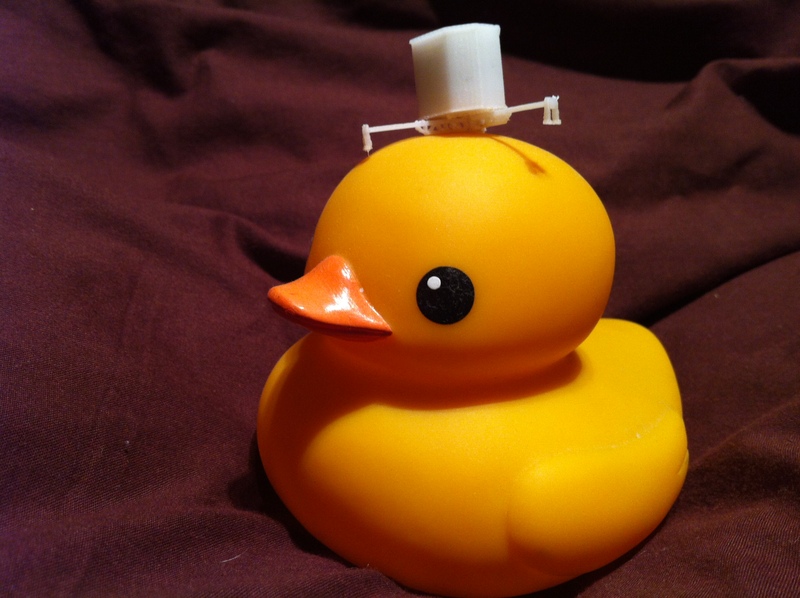 His work on plastic clips is documented on his website here. 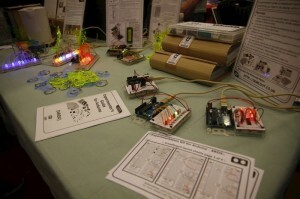 Our friends at Oomlout were there again showing off their kits (plus their excellent documentation). Pancake bot: food, 3d printing and Lego. Brilliant. A giant Arduino Uno microcontroller and breadboard. That works. Mad. 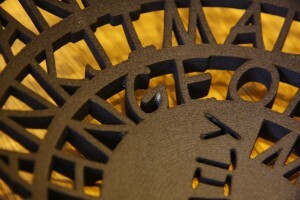 I’ve been following Martins laser cutting blog for a while now, so it was great to meet him in person and play with a few of his neat wooden projects. 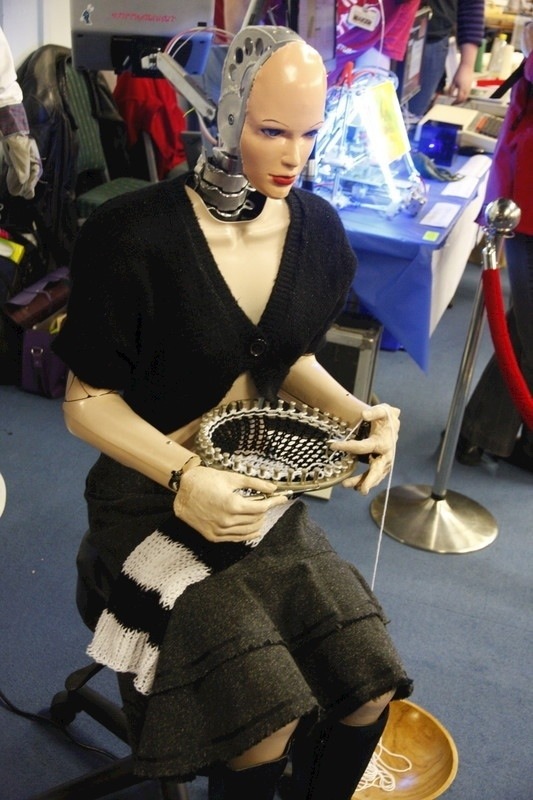 One of the freakier pieces of robotics was this mannequin knitting machine called Agnes. 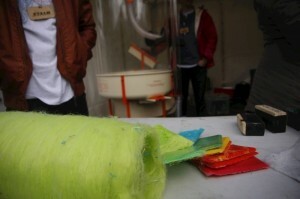 Using human like movements it knitted continuous woolen scarf. As big fans of anything that creates sparks, we were excited to spot this wimshurst generator hiding away in one of the halls. It was actually a permanent Life Centre demonstration model, rather than a creation for Maker Faire but never the less we were thrilled to be allowed to play with it. Having made a few static generators ourselves, we were impressed by how it ‘just worked’ with no cleaning or fiddling despite having sat ignored on a shelf for quite a while. This entry was posted in Uncategorized and tagged Makerfaire, mark, Simon on 11/06/2013 by admin. Andrew Lamb, my best mate from university and head of Engineers without Borders, asked if there was a way to create a ‘real’ version of their logo. Though it sounded like an interesting challenge and agreed to give It a go. 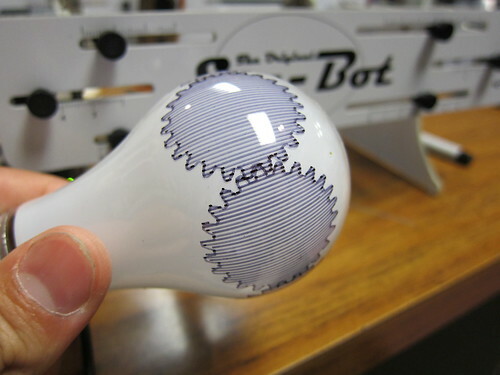 My first thought was to use an EMSL’s Egg-Bot kit to draw the logo onto a bulb. I showed Andrew the typical output of Egg-Bot and we were both concerned the streaky finish could spoil the look of the logo. 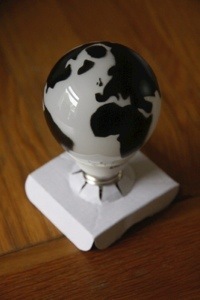 Idea 2 was to use a vinyl cutter to slice the shape of the landmasses from sticky backed vinyl so they could be stuck to a bulb. I quickly realised that it would be very difficult to apply 2D stickers to a very 3D bulb without creating creases and wrinkles. 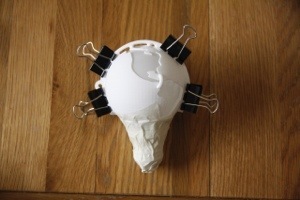 Idea 3 was to create a mask such that the bulb could be painted without requiring too much skill. The painting part seemed plausible, the challenge was how to create an accurate mask that could be quickly applied to an actual bulb. Thinking about different mask materials I’d seen before, I assessed how suitable they were: wax-too difficult to apply, masking tape – wont conform, vinyl-same, silicone/rubber-might work but could distort, rigid stencil -might work but might not give a sharp cutoff. So painting through a silicone or a rigid stencil seemed worth trying but both sounded difficult to form into the correct shape. Now if I was an artist, I probably would have mixed up some latex, formed a rubber shell and skilfully attacked it with a scalpel. But I’m an engineer, so I decided to 3d print it. I also don’t like repeating what others have done, so I started looking around for similar projects to learn from. 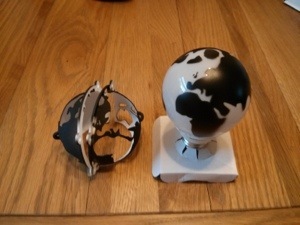 That’s when I found TBuser’s Two Colour Globe on Thingiverse. 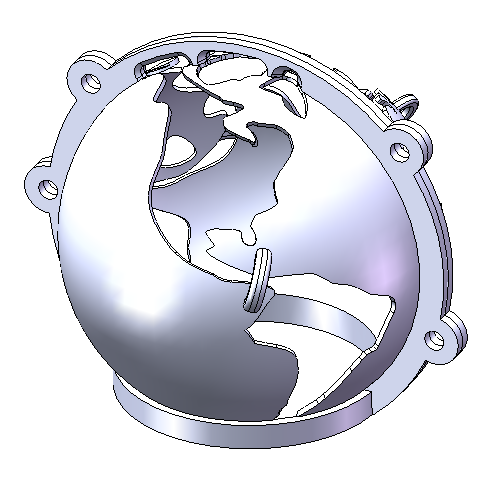 That was a brilliant starting point, as I now had a nice 3D CAD model of the world, with the land masses as a separate body so I could digitally manipulate it to turn it into a mask. Whilst I’m reasonably proficient with a few CAD program’s, 3D surface modelling is definitely not my thing, so it took several Iterations of computer program and technique to create the right shape that would be useable, paintable and printable on my printrbot. For the last print I had designed my own support structure to minimise the print time but allow the detailed shape to be printable. With some fettling I got the mask to approximately conform to a light bulb, but the print resolution and slight warping meant that it wasn’t a tight fit on the light bulb and I was worried that there would be too much paint bleed. 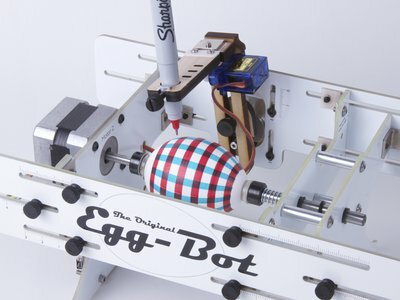 The Printrbot version was good enough to give me some confidence that the basic approach was sound, even if the output using this exact method wasn’t good enough. So I uploaded the design to shapeways and was pleased to see that my Printrbot optimised design would only cost ~€30. 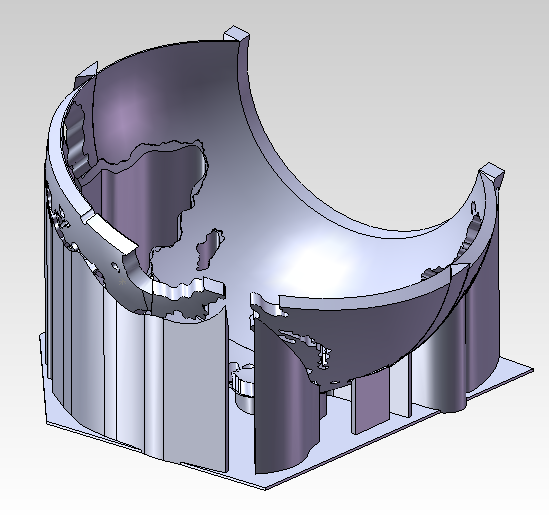 Knowing that I could reduce the cost with some optimisation, and incorporating what I’d learnt from my prints, I set about redesigning the mask. 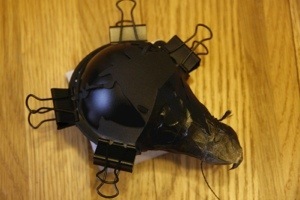 This time the mask was a thin shell with local stiffening. 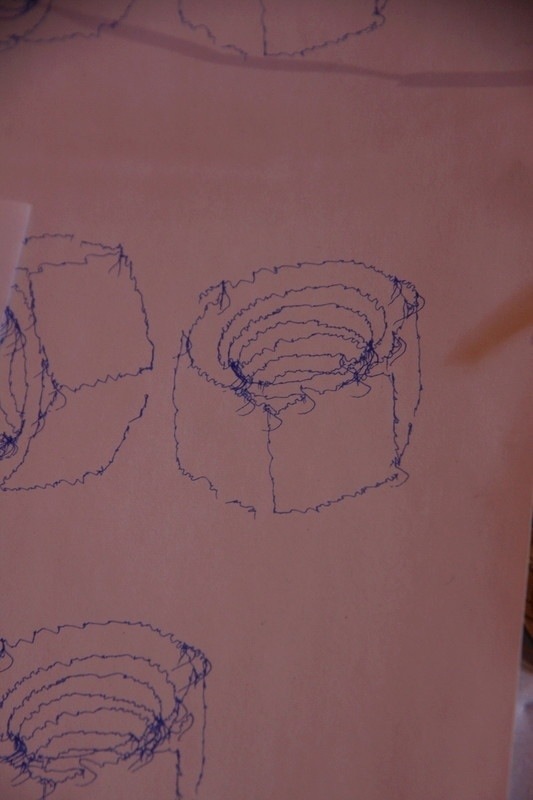 I added ribs around the sides and base, and included small bridges where two ‘seas’ nearly met to increase the stiffness but keep the material volume low. 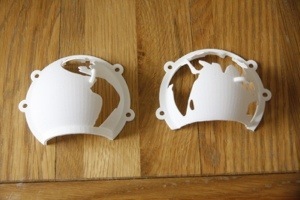 The new design cost ~€18 for both parts and took two weeks to arrive. The prints arrived well packed and n good condition. I was very pleased with the resolution and the ‘strong, white and flexible’ material lived up to its name. Initially it looked like they would be perfect, but a test fit to a bulb showed that hadn’t been careful enough with my measurements. 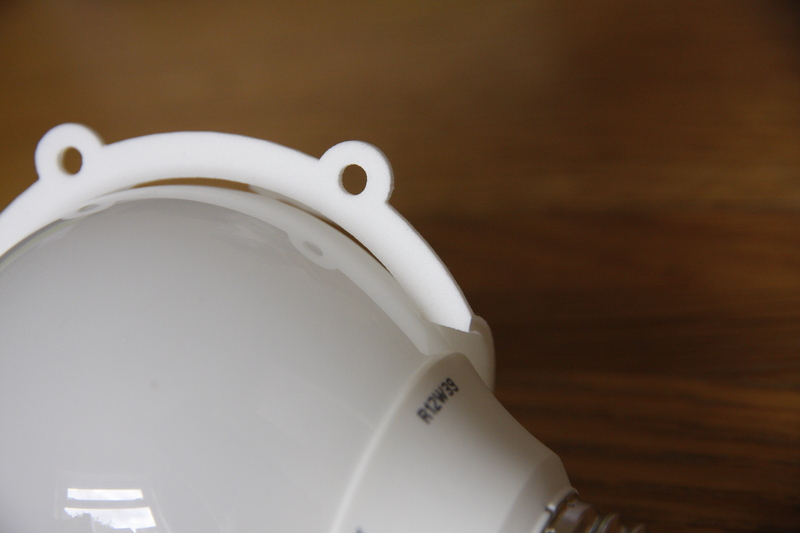 Whilst the energy efficient bulbs I’d bought we’re almost spherical, the last bit of the bulb connected to the base is much closer to conical, so the mask still didn’t fit very tightly. 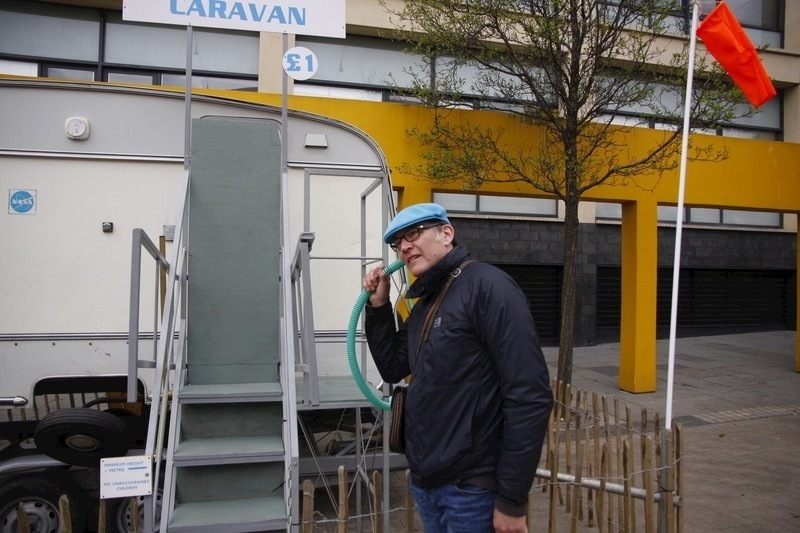 It was close enough to make fit with a bit of fettling though. Attacking the mask with first a file, then a Drexel ‘milling’ bit, I removed the rib around the base and added clearance around the offending area. The mask was still a bit looser fitting than I wanted but was definitely good enough to try painting. 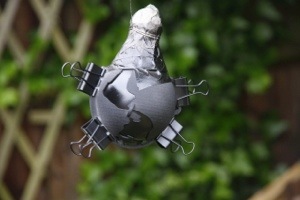 A bit of masking tape and some bulldog clips held the mask in place and protected the rest of the bulb during spraying. I was very pleased with how the painting came out. 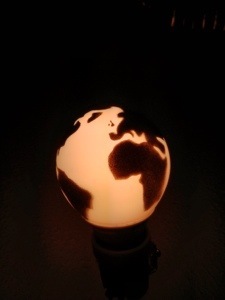 It’s not perfect, and the southern hemisphere is a bit blurry around the edges, but it looks good and with a little refinement could be a practical way of making many bulbs. What’s next? 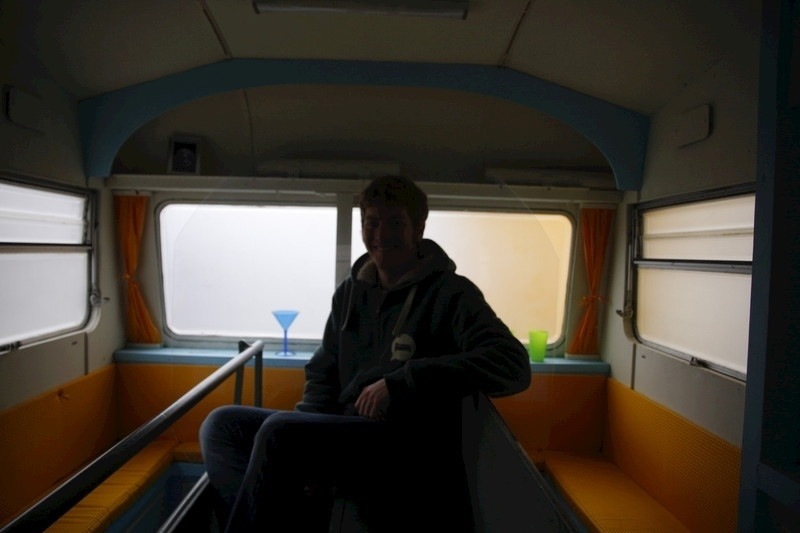 I’m happy to have gotten to this point, so its up to EWB what happens next. 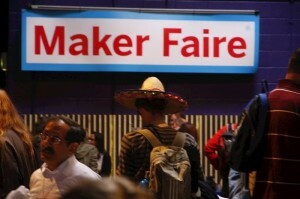 If they like it and want more bulbs making then Ill probably get another mask made. 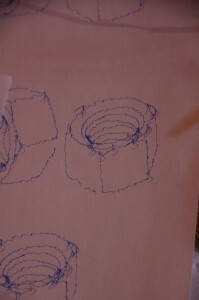 The shape needs tweaking to fit better, but I think the biggest change will be the material. 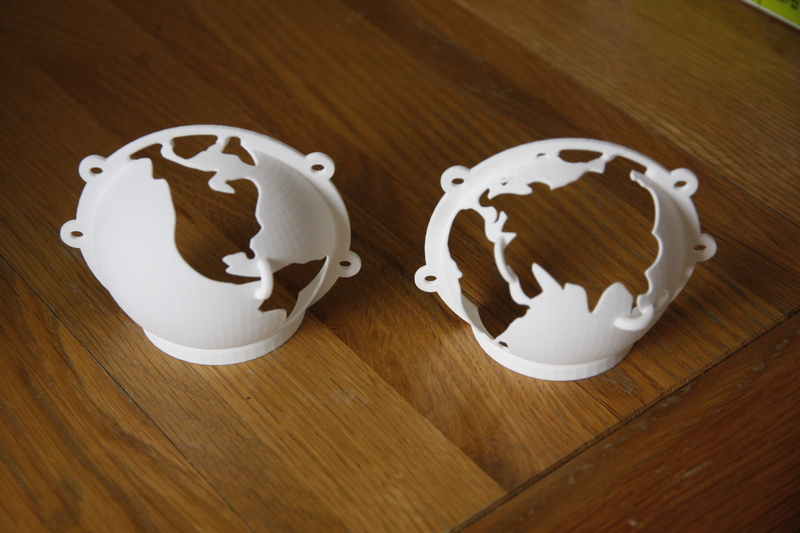 Shapeways have just released a “new material” ‘for evaluation’ that is quite stretchy. This could allow me to combine my initial silicone mask idea with 3d printing, getting a complete mask that conforms well to slight variations in bulb shape and eliminates the blurry edges. This approach could have other interesting applications so it could be a good experiment in itself. 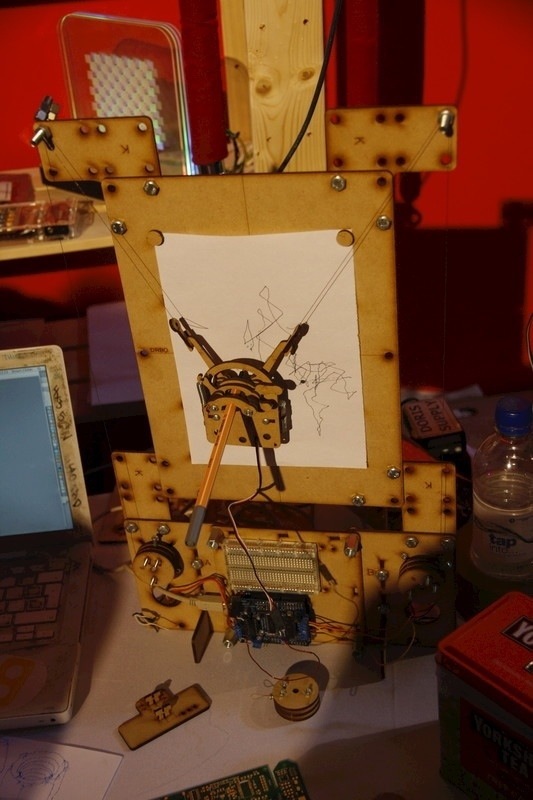 This entry was posted in Uncategorized and tagged 3dprinting, EWB, mark on 11/06/2013 by admin.